Alberto Contador (Saxo-Tinkoff) bested Daniel Diaz (San Luis Somos Todos) on the summit finish of the Mirador del Sol in Merlo on Saturday in the Tour de San Luis, but Diaz hung close and should have the final overall classification pointing in his favour after Sunday’s final stage, which is not expected to shake up the GC standings. Contador broke away in the final kilometer of the nearly 7km climb, which was steep enough to discourage most attacks until the finish line was in sight. The Saxo-Tinkoff rider got a gap over a handful of favourites and looked as if he could ride to the finish alone, but Diaz closed it back down with 400 meters to race. Contador used a final surge to put two seconds of distance ahead of the runner-up, but Diaz pulled out 16 more seconds on chief rival Tejay van Garderen (BMC Racing), who took sixth on the stage and held onto second place overall, although he is now 33 seconds behind Diaz. Stage three victor Alex Diniz (Funvic Brasilinvest) took third, in the same time as Diaz, and seems assured of the third place overall he currently occupies. Contador is fourth overall, at 1’02” back. Showing solid performances in the mountains all week, Arnold Alcolea (Cuba) was fourth on the stage, and Mauro Santambrogio (Vini Fantini) was fifth. The 2013 Mirador del Sol top two mirrors that of the same stage a year ago, with Contador ahead of Diaz. Although Contador’s result was eventually removed as part of his suspension, and Levi Leipheimer was third on the stage then to lock up the overall. This year, home squad San Luis Somos Todos can celebrate a stage five win with Emmanuel Guevara and the likely overall victory with Diaz. Meanwhile, Contador celebrates the mountaintop stage win, the help of his team-mates, and the comforting sign that his form is progressing nicely. 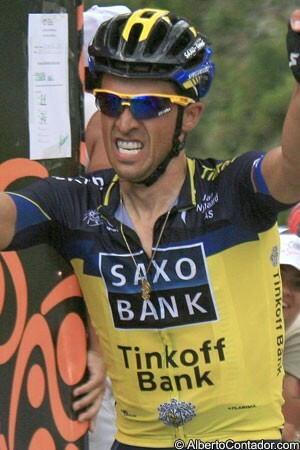 Contador had tried to get away from Diaz, Diniz, and others several times over the last few stages, to no avail. He mused on those opportunities, adding that he is carrying some extra weight on his frame. “It’s not going to work every day,” he mentioned, referring to previous attacks. “My weight is still not on my side – it is a little high, but that could also be because of the heat, because the rest of the team is similar. That limited me a little in the mountains, but I’m happy, because we should be doing a good job over the next few months. Stage six of the seven-day event took riders 156 kilometres from Quines to Merlo, and the top of the Mirador del Sol. The category-two Alto de Cantana was the first of two major climbs, peaking at 33km into the day, but no break was able to establish much clear ground over the top. After 60km, four men were off the front with a three-minute advantage, in Marc de Maar (UnitedHealthcare), Mauro Finetto (Vini Fantini), Adriano Malori (Lampre-Merida), and Pieter Weening (Orica-GreenEdge). Diego Rosa (Androni Giocattoli) joined later, eventually forming a group of five. With 60km to go, descending into the village of Concarán, the quintet had just over a minute in hand with the big finishing climb still a ways off. There the gap stood over the Argentine countryside for the next 50 kilometers, but the five leaders were nailed back just as the Mirador del Sol, at 7km in length and averaging almost nine percent in gradient began to bite in. With the steepness and length as major factors, riders were in survival mode heading to the top, and Contador picked the right moment to go, as only Diaz was eventually able to follow. The Spaniard pulled out an immediate gap before Diaz eventually rode back to him, but could not summon enough strength from the raucous home crowds to come around. Contador surged one more time and saluted over the line, but much of the post-race attention was centered on Diaz, who had likely sewn up his biggest overall victory. 3, Alex Diniz (Funvic Brasilinvest) at s.t. 5, Mauro Santambrogio (Vini Fantini) at s.t.